Over the past decade, I've toiled away on a very important project. My mission was to develop a speed-training system. One that ingrains the basics of conversational hypnosis right into the unconscious mind. So anyone exposed to my secrets can become proficient...very rapidly indeed! "You need years of studying!" "You gotta bust your brains to remember techniques and scripts." "You have to fight tooth and nail to induce trance." I'll reveal why in a moment. Fact is, I've created a process that shaves years off the learning curve. It requires no rote memorization and you'll retain everything necessary for any covert hypnotic encounter. No figuring out how to make hypnosis work. No guessing what to say and when to say it. The right words and gestures flow out with ease. Like water from a spout. At just the right time. Drop people into waking trances anywhere at any time! Charm others into following your "hidden" suggestions! Sell like a superstar to more customers at higher prices! Rid people of fears, phobias and a slew of bad habits! Motivate "slackers" to get their act together at work or home! Sway rigid minds to accept your point of view with no resistance! And finally be in total control of your life from now on! After exposure to this process, hypnotizing people during conversations is second nature. Automatic. It will happen in a "nice-and-easy" spontaneous manner. No thinking involved. Kind of like riding a bike or tying your shoelaces. A friend told me about this secret while I attended Exeter University. I was studying for a law degree. The workload professors dished out was "insane". I had to cram an enormous amount of information into my head. And at warp-speed. Time was of the essence. So I took his advice and began using this secret. I used it before sitting down to study. I used it before reading. I used it during tests. Basically, I used it all the time hoping to gain an edge. Before discovering this secret, school frustrated me to no end. I dreaded study time. Reading bored me to tears. Taking tests made me break out in a cold sweat. After applying this secret, everything changed. I finished twice the work in half the time. My grades shot up. My confidence exploded. I graduated with ease... and... landed a dream job at a prestigious law firm. This secret saved me from disaster. And helped me accomplish a big goal. A few years later, I switched careers and entered the hypnotherapy field. Conversational hypnosis is a wonderful skill to possess. It hands you the tools to be a force for good in the world. Influence people to turn their lives around on a dime. Help them make profound changes fast. Convince, influence and motivate others to comply with your requests... while... they get what they want too. I just love it when my students take the secrets I teach them and improve their lives. One of those students was broke with no prospects. He was couch-surfing to put a roof over his head. Then he ran across my conversational hypnosis system. The first major improvement for him took place while he was working as a waiter. Customers loved him so much they showered him with big tips. He was making 100% more in tips than waiters with years of seniority on him. One customer even gave him $700. Which blew everybody away. He simply applied a few covert techniques. People starting eating out of the palm of his hand. Needless to say, he no longer had to couch-surf. Later, he opened a successful hypnotherapy practice. Years ago, my brother got into a fender bender. The lady in front of him (the one whose car he hit) was livid. She flew out of her car spitting fire as they say. Pure rage flushed across her face. My brother knew this could get ugly. Really ugly. Without thinking, a simple conversational hypnosis technique came to mind. He said a few words. Nothing earth-shattering. The "mad-as-hell" woman stopped in her tracks. Her anger diffused like a time-bomb seconds before blowing up. They exchanged details and... a potential nasty scene... simmered to a semi-pleasant interaction. All due to a couple choice words. That's the power of conversational hypnosis in action. Another student wanted prime shelf-space for a product in the fastest-growing supermarket chain in Europe. The executive in charge decided to give the space to someone else. My student got on the phone with the decision-maker. He had to save this deal. His job and livelihood was on the line. In a matter of minutes, he turned a multi-million dollar loss into a multi-million dollar gain. He convinced the executive to change his mind and give him the coveted shelf-space. But not at all unusual when you know my conversational hypnosis secrets. They are practical and apply in the real world. You can use them to increase your income. You can use them to turn a dreadful situation into peaceful resolution. You can use them to land a much-needed sale or dream client. Or anything else you want. But one problem stops people dead in their tracks. This problem stifles the learning process, curbs natural creativity, baffles the heck out of hypnosis students... and... prevents them from reaching a high level of proficiency. A large body of scientific study suggests the mind learns unconsciously. Afterwards, the conscious mind catches up. This, of course, flies in the face of "common" knowledge and practice. The entire educational system is based on consciously acquiring information and technical expertise. The inaccurate assumption is that the mind retains by thinking. You "drill" facts and figures into the brain. As a result, all the stuff you studied sticks in the memory banks. Learning anything this way is painful... boring... and... a god-awful experience! Most of us hated school because of the way "they" forced us to learn. I'm happy to say, there's an easier (much easier) way. Consider this: You're driving around town with the radio on. The sun is shining. Birds singing. You feel relaxed while the new "song-of-the-month" plays every so often. Without trying... after hearing it a few times... you retain the words and start singing along. You never consciously sat down with the lyrics to memorize them. You probably never even heard the entire song from beginning to end. Yet, within a few effortless exposures to the music... next thing you know... well, you know the song. This is called... implicit learning. sort of knowledge is being acquired." The way implicit learning works is like this: You perform a series of small, seemingly unrelated tasks. Each task builds on the previous. You add other more complicated tasks. Suddenly, you develop a certain skill. Without trying. Without forcing things. This happens all by itself. The exciting thing is you by-pass the conscious mind. You remove it out of the way. The skill ingrains in your unconscious. Available in a split second. No need to remember anything. No need to get things right. No labor-intensive study. The learning curve shortens dramatically too. Hundreds of studies exist on the subject. If you're interested, read more about it in the Handbook Of Implicit Learning (from SAGE Publications, Inc.) by Michael A. Stadler and Peter A. Frensch. As I said above... while this "sounds" great... one big problem looms. Our modern society does not use this process to teach. The school system is set up in the exact opposite manner. You're forced to memorize dry boring material. Sitting down. Mouth shut. No moving allowed. Eyes on your own paper. If you as much as budge or look the other way... the teacher calls you out! Ridicules you in front of the class. Sends you to the back of the room or (god forbid) the principal's office. You're scared into studying like your life depends on it. Which, by the way, causes all sorts of resistance and stress. Compulsions. Obsessions. You name it. The entire unpleasant experience is based on explicit learning. Where you consciously focus on new and hard-to-understand material. And all the fun is taken out of it. And they wonder why grades keep falling and kids are dropping out of school in droves. From my experience, this is how hypnosis is taught too. Because they teach hypnosis just like traditional schools. Students complain to me all the time. "There are so many techniques to recall." "It takes waaay too much time." "Lots of trial and error to find what works." "I'm not sure which of the many approaches is right." "My lack of confidence gets in the way." "I have a hard time grasping the basics." "How can I remember all this information?" For years, I felt the same way. Struggling to understand basic hypnosis techniques myself. The traditional approach to learning was well-ingrained in me. I had gone through 12 years of school. Then another four years at a university. When the hypnosis "bug" bit me, I searched for the best teachers in the world. And ran into the same issues people complain about before discovering my secrets. The "experts" teach hypnosis in the conventional way. The result: Their students grapple with the hypnotic process. Many drop out. Others strive for years without much progress. A handful succeed despite themselves, their education... and... the well-meaning but incorrect "experts" they trusted. I'm sure I've discovered it. Remember the secret I told you about earlier? The one I used to become a star student while attending university? You can use that secret to speed-learn anything. What is it, you ask? It's...Using Hypnosis For Automatic Unconscious Learning! Think about it: Conversational hypnosis is a tool to influence the mind. Right? So why not use conversational hypnosis to teach conversational hypnosis? But in a specific way. By giving the conscious mind enough "fodder" to stay active. So students don't go into a deep trance. And they remain in total control. I figured out how to apply the implicit learning model to conversational hypnosis. Instead of trying to concentrate... you have fun participating! Instead of hog-tied to a desk... you move around like in a real conversation! Instead of memorizing... you practice simple exercises! Instead of studying... you engage in real-world simulations! Instead of dying of boredom... you enjoy an exciting experience! Meanwhile, my conversational hypnosis secrets seep into the unconscious. They await for recall at a moment's notice. Just when you need them. I tested this process with over 5000 students during live training seminars. The results floored me. People with little to no formal training mastered the basics within hours. After taking my class, mesmerizing complete strangers while chatting with them was easy as pie. Make More Sales: Bryan Westra was a sales person from Kentucky. He began using conversational hypnosis to close deals. Soon his closing ratio shot off the charts. He was promoted to the top of the organization. He later left and started his own successful company. Raise Prices and Fees: Peter Foggin is a hypnotist from the UK. He used to see 5 clients a week. After learning conversational hypnosis from me things changed. He now sees 5 clients A DAY four days a week. And he doubled his fees without a hitch. Help People: David Blender helped a client quit smoking after 45 years on a two-pack-a-day habit. Rita New helped her 7-year-old grand daughter beat anxiety attacks. Ralph Stephens helped his office manager start exercising and losing weight. David Sanders helped his daughter find her "happy place" and an unshakable inner confidence. I have tons of these stories and testimonials. Stop Procrastinating: My style of conversational hypnosis is often the motivational key to success. Renee Jones used a mind bending language technique on a writer who was stuck. Two days later the client wrote 28,000 words at a writing retreat. Relieve Pain: Ron Soderstrom, a physical therapist from Hawaii, has applied these secrets to lower and eliminate pain in his patients. David Pendleton, a consultant, used my covert techniques to help a young lady overcome a deep depression. I could post hundreds of examples like the ones above. Regular people, service professionals, business owners, sales reps, coaches, parents, hypnotists and hypnotherapists... you name it... report fantastic results after speed-learning my conversational hypnosis secrets. Least Amount Of Time Possible? Hands down, the best strategy, is to apprentice under an expert. If you can pull it off, direct mentorship has no equal. You'll see, hear and experience conversational hypnosis at the highest levels. But let's get real. Because it's probably not gonna happen. I can't offer individual access to me any more, as I simply don't have the time. The next best way is to attend a live event or watch the recordings of one. My seminars attract people from all walks of life. These folks want to train their personal influence muscles. A key concept that supports implicit learning is... participation. That's why I include dozens of interactive exercises during seminars. The exercises hone your ability to perform covert hypnosis in any situation. The exercises are fun, jolt you out of your comfort zone... and have the side benefit of... boosting your powers of influence. All of this happens under the radar. Below the conscious level. While you have fun, the unconscious mind acts like a sponge. Soaking up the training without conscious interference. Now, the last live conversational hypnosis training was held in London, England. 175 people attended from all over the world. People came from: Poland, Portugal, England, Holland, Ireland, United States, Hungary and many other countries. It was like a hypnosis "melting pot" of sorts. Lucky for you, I had a camera crew tape the event. Every single second. Because I knew thousands of people would love to have the information I presented. But they could not attend for one reason or another. When you watch these videos, it's just like being in the audience. Unlike listening to audios, the videos let you see me in action. You can follow along with the training as if you're right there in person. Plus... and this is huge... you'll hear audience members ask me questions. The same ones you may consider. And, you'll also hear me answering them. 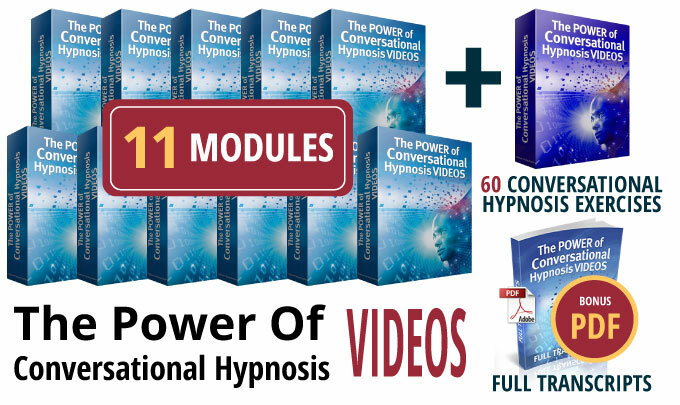 Would you like to start mastering covert conversational hypnosis just by watching a few videos? I designed the training for complete novices and for traditional "direct" hypnotists keen to learn my conversational hypnosis secrets. In other words, I could pick someone off the street, sit them down in front of their TV, have them watch, listen and do the exercises... and... in half-a-day... they will put anyone in a trance during a conversation. There's over 14 hours of mesmerizing instruction. I dare you to not be able to hypnotically influence anyone after going through this training program. It's impossible. Why? Because I give you 60 exercises that will transform you into a powerhouse of influence. Each exercise plants a specific hypnotic process into the unconscious. By the time you're through, no one will resist your suggestions. The real secret of effortless hypnosis that works when it counts! How to "catch" the mind trying to sabotage your best efforts! I'll show you how to beat the bad habits (rooted by years of traditional education) hampering your natural ability to perform covert hypnosis like a pro! Why "beating" yourself up stunts progress and prevents you from unleashing the built-in persuasive potential you already possess! Two quick ways to take the difficulty out of practicing hypnotic exercises! How "stealing" enhances your self-image as a great hypnotist! A perfect example of how experienced hypnotists let prior knowledge and training prevent them from acquiring new and better skills! And the easy solution no one ever talks about. A rule about touching people during a hypnotic encounter never to break! Which thoughts enhance and which ones diminish your influence! The secret to "sweeping" people into a covert trance induction! How to set the right hypnotic context so you're in charge every time! Follow my instructions here... and... whenever you meet anyone you'll be in control. Why it's impossible to make scripts work during covert hypnosis! A simple way to eliminate "performance anxiety"... while... getting more compliance to your suggestions at the same time! How your body language, speech and mannerisms tell others to respond to you! Plus... the uncanny way your mind supplies just the right thing to say or do at just the right time! A neat exercise to relax yourself in the blink of an eye! How to introduce riveting trance themes into conversations using power words! You'll be amazed as people hang on to your every word with rapt attention... regardless... of what you're talking about! How to present an "illogical sequence of ideas" that lead to a hypnotic state! How to stop the Law of Reverse Effect from screwing up your intentions! Why hypnotists get stuck during an induction... and... two easy "fixes" that keep you in the flow no matter what! Plus... a salesman's trick that prevents you from losing control of an interaction! Module 3: Hypnotically Leading Others And The Power Of "Yes Sets"
Why inducing trance in yourself makes you a better covert hypnotist! How to "cherry-pick" empowering experiences from the menu of your mind... so... every hypnotic encounter ends on a positive note! How to never run out of things to say whether you're talking to a friend or a stranger off the street! This is perfect for shy, reserved types who freeze up and or get tongue-tied. It'll never happen to you again after discovering this technique for keeping conversations going as long as you want. Why mindset trumps everything else and is your most important asset! How to construct a "room" within your mind to store the hypnotic skills, abilities and attitudes you'll need for conversational hypnosis success! The fundamental "building block" of how your unconscious mind reasons! Why "truth" is mostly relative and how to use this insight to change... or at least direct... human behavior in any direction you choose! The only thing that inhibits the hypnotic process and how to deal with it! How to "hijack" someone's resistance so they trance out on the spot! How to get total strangers into the mental habit of agreeing with you! How to "manipulate" reality using the Law of Association! How to dissolve long-held beliefs... and... create new beliefs that were never true for someone before! How to get people to reveal their deepest personal secrets! How to present false ideas in a way that makes them seem plausible... and... how to nudge people to accept bizarre suggestions that don't make sense! Ethical Influence: The true story of how an entire industry lost credibility due to underhanded tactics... and... why ethical behavior is the surest path to long-term success in life! A simple formula for becoming wealthy! I'll give you the title of the book from where I read this secret. It just might be the most profound way to riches you'll ever read about! Why people destroy relationships and can't fix the problem! The Piggyback Principle: Your key to making unbelievable claims and suggestions perfectly acceptable even to the most critical of subjects! How to talk to the conscious and the unconscious mind at the same time! How to cause physical sensations in a subject's body just by choosing the right mood and words! A crucial question to ask yourself so all your indirect suggestions go unnoticed by the conscious mind... and... drop undetected straight into the unconscious! Why "Universal Experiences" weaken the critical factor and let you string subjects along until they have no choice but to agree with you! How I got a roomful of people thirsty without saying a single word! Why the eyes truly are the "windows of the soul"... and... how knowing this lets you engage with people on a deep emotional level! How blind people use their visual process! How to arrest attention, build positive emotional pressure and put people under your control with the Hypnotic Gaze! A subtle way to disrupt the critical factor so your suggestions quietly sneak into the unconscious mind like a thief in the night! How the signals we send out unconsciously affect everyone around us! How to relax people so they fall into a covert trance! What the phrase "hypnosis is anything but a casual relationship" means to you as an ethical hypnotist who has everyone's best interests at heart! How to get to a point where hypnosis happens all by itself without hardly any conscious involvement! A nice description of hypnotherapy which reveals your true role in the process of helping someone else with their issues! One thing to stop doing in order to influence others with your words! How to emotionally connect with people who don't speak your language! How to capture someone's imagination with your eyes! What it means to "hijack" or "ratify" a person's experience! How to "prime the mind" to accept suggestions... and... how to strengthen and reinforce the raw power of every suggestion you'll ever make! One of the most powerful techniques for getting "failed" suggestions to take! How playing the game "Dueling Hypnotists" increases your covert influence... like nothing else! A big misconception among some in the hypnotic community about what it takes to create a trance experience! Why getting people to disagree with you often leads to a "Yes!" The easy mental shift exercise that always puts you in total control of any interaction! The "hard-and-fast" rule to covert hypnosis success to always keep in the back of your mind! Follow my advice on this, and you'll never have problems inducing trance in any setting! The Shaman's secret to creating a hypnotic atmosphere... and... why it forces people to hang on to your every word! How to become the most interesting person in the world. A simple way to win the admiration and adoration of anyone you meet! How to uncover the verbal rhythmic "sweet spot" perfect for lulling your subject into a compliant state of mind! The trance-enhancing effect of the "echo" technique! When "thinking" is helpful... and... when it gets in the way! Where to spend your time and energy... if... you don't want to fail as a hypnotist! Live demonstration of how to ratify an experience... while at the same time... intensifying a waking trance to the point where the subject does anything you ask! How to ferret out hypnotic triggers while talking with someone... and... use those personal trance words to begin and enhance an induction! I share with you the "Sherlock Holmes" technique for detecting the key words your subject is most likely to get hypnotized by! The true story about an infamous book authorities banned because people were killing themselves after reading it! A neat way to re-introduce trance in a follow up hypnotherapy session without starting a brand new induction from scratch! Instant Paradigm Shift! The magic formula for changing someone's state of mind on a dime... and... convincing them to take the action you want NOW! The biggest mistake people make during the influence process! An example of a negative hallucination, how it happens during covert hypnosis and how to steer people back when it occurs! An elegant strategy for crushing objections before they come up! The trick to resolving conflicts instantly! How to predispose the mind to acquire new skills with ease! The "referential index": Why it allows you to plant undetected suggestions directly in someone's mind! How to prepare people emotionally to succeed at anything they try! A 6-word question that uncovers how susceptible someone is to conversational or any other kind of hypnosis! A mental pitfall that makes you less... not more... influential. Why you can't influence... unless... you've been influenced first! A famous quote by martial arts master Bruce Lee that reveals the best way to approach hypnosis... or... anything else for that matter! The three most important principles in hypnosis! 5 hypnosis "laws" you should commit to memory! How to read minds, influence actions and predict outcomes with almost 100% certainty... plus... a secret Ericksonian technique that turns absurd statements into acceptable suggestions! How to gradually become more hypnotic so people don't notice what's happening while you're talking with them! What an "invisible" yes is and why it's crucial to get as many as possible! Body language that reveals when someone is mesmerized and drifting off into a responsive hypnotic state! One word to avoid using or you'll create conflict instead of resolution! Watch as a roomful of hypnotists convince each other they are conversational hypnosis experts! How to train the unconscious mind to respond perfectly! How to use emotionally-charged "hot words" to make a bone-crushing impact with everything you say... and... the secret to saying the right things when you're at a loss for words! Why reading The Cat In The Hat will make you a better hypnotist! Another technique (this one relies on a fun visualization exercise) to keep a conversation going when you're stuck and don't know what to say next! Module 11: Framing, Re-Framing And "The Unconscious Blitz"
Examples of how to set context so suggestions stick like crazy glue! What you must know about the concept of "frame control"... how to create the perfect frame... and... why the wrong frame will make all your attempts at covert hypnosis impotent! The three main types of frames that let you steer a conversation to the end result you choose! How to "guide" someone's emotional reaction! How to make anything you say seem like a good idea... even if... it's off the wall crazy! Can you present ideas and dissolve objections at the same time? Yup! But don't try to guess because I'll show you how! How to test for compliance... and... gently guide non-compliant subjects to agree with whatever you say! Your best bet for overcoming a critical factor that's on high alert... how to check if a subject is under your influence or not... and... the trick to making people do exactly what you request! An exercise to help you come up with metaphors that create a hypnotic conversation! How to talk directly to the unconscious mind using the "triple layer" hypnotic voice! What the "might as well" feeling is... and... how it pushes people to do what you ask! What I describe above is only a fraction of the material covered. You can search high and low... and... I guarantee you won't find the quantity and quality of information delivered here in any other conversational hypnosis training. 14 Hours of proprietary content! All of it designed to turn anyone... anyone... into a influencial force. If being in control of your life -- at home, at work, at play -- is important to you... then... this information is your "golden ticket" to a fulfilling life. 60 conversational hypnosis exercises! These exercises are the "meat" of the program. They ensure the secrets, strategies and techniques I teach will nestle deep in your unconscious. Ready for you to use any time you want to hypnotize someone during a conversation. Searchable PDFs with full transcripts of every video! I'm giving you every chance to make this skill automatic. By watching the videos... doing the exercises... and reading the transcripts, you supercharge your ability to perform covert hypnosis. Unlike listening to audios, the videos give you a distinct advantage. I'll show you what to do... and... I'll show you how to do it. You see and hear attendees asking questions... and... you see and hear me answering them. Really, it's like being there in person, except you have the added benefit of being able to "rewind and re-watch" the content whenever you want! How long will it take to go through the training? Up to you. You could go through the entire training in a couple of days. Or you could take a week watching a few videos a day. Even if you pace yourself, you'll know how to induce virtually any subject by next week. If you've invested in my programs before then you know the quality of the material I offer. You know my training is second to none. And you know I've become. through lots of hard work, the foremost authority on conversational hypnosis. I dare say, there is no one in the world with my track record. I already tested and taught the secrets in this particular program to over 500 live students world wide. Plus 1000s more have invested in this home-study version of the live training. And you'll be able to inspire, convince, influence and motivate others by the time you finish the training. On top of that, I'll practically give it to you for a steal. You won't have to invest $1000s on live seminar tuition. You won't pay for airfare, hotels and food. You won't take time out from work. You end up saving a small fortune by getting the video program. So, instead of paying THOUSANDS on all of that, you can have this unique training for a very reasonable $747. 50% OFF Discount: However if you order right now you can claim a 50% OFF Discount Coupon and easy-pay plan...... $747 just 4 simple monthly installments of only $97. This is a bargain. Especially when you consider it's taken me almost two decades to discover these conversational hypnosis secrets for myself. Over 10,000 hours of study and application in real-life situations and my own hypnotherapy business. Then I had to figure out how to teach them to others in a logical, step-by-step system. And I had to uncover a process which allows anyone to become an expert at the basics without even trying. And just think: In a few days you'll become so good at conversational hypnosis... that... you can then use this life-changing skill for the rest of your life. And... You can't put a price on that! However, I do want you to feel safe about making this investment in yourself. I stand behind every product, event and program with my name on it. No compromises. No cutting corners. No monkey business. The only way for you to prove my promises is to try this program. I don't want anything getting in the way. So you've got a full 60 days (that's two months!) to go through it. Like I said, you can easily finish the whole thing in a couple of days if you want. Or you can take a week or longer. Your choice. After this program, you can immediately go out and test what you've learned. You'll be blown away at the results. If you watch the videos and do the exercises... then... the basics of conversational hypnosis will be ingrained in your unconscious. Which means, you will easily hypnotize others just by talking with them. People will comply with your requests at the drop of a hat. Easily persuade your boss to give you a bigger raise or better position. Convince a potential employer to hire you on the spot. Influence customers to purchase more products at higher prices. Get your kids, spouse or significant other to see things your way. Entice someone you've had an "eye on" to go out on a date. Talk hypnosis subjects and clients into making profound changes fast. And anything else you can think of that requires another person's cooperation. Because your ability to communicate with other people is THE one thing that determines your level of success (or lack thereof)... more than... anything else. In 2002, Harvard University released an interesting study. Researchers wanted to find out why surgeons got sued. You'd think malpractice lawsuits were the result of shoddy medical care. Well, you'd be wrong. Nalini Ambady, Ph.D., suspected something else was at play. The hypothesis put forth was that the communication behaviors of surgeons was the driving factor of litigation. Could this be true? Could it be the way a surgeon communicates with patients determines whether or not they will get sued? I'll give you the "Cliff's Notes" version: Researchers listened to two 10-second clips from recordings of conversations surgeons had with two patients. The short clips were extracted from the first and last minute of the interaction. Furthermore, the audio clips were "content-filtered." Which means the high-frequency sounds from the surgeon's speech were removed. Those are the sounds allowing us to recognize individual words. After content-filtering you're left with an incoherent jumble. In other words, the intonation, pitch and rhythm of the sounds was intact. The content was erased. The researchers could not understand what was said. They could only judge each clip based on HOW the surgeons expressed themselves to the patients. Even more interesting, researchers had no clue about each surgeon's skill level. They didn't know about the surgeon's education, training, experience, particular specialty or claims history. Researchers had no idea what the doctors were even saying. The analysis of each clip was done only on the basis of the surgeon's tone of voice. Based on that factor alone, researchers were able to identify surgeons with previous claims with 95% accuracy. The doctors getting sued had no idea it was their tone of voice incriminating them. And conversational hypnosis is the master key to effective communication. I've done the best I can to explain why getting this video training program is in your best interest. Ultimately, if you interact with people you need this. It will make your life so much easier. More fun. More exciting. More... everything! Best part: You can watch the videos starting in the morning... and... before dinner you'll know how to start hypnotizing people during conversations. YES! Igor, I know conversational hypnosis is the most important life skill I could ever hope to possess. And I'm so excited you are offering your secrets in this video training program. I'm especially thrilled I can master the basics in just a few hours by watching these step-by-step instructional videos. 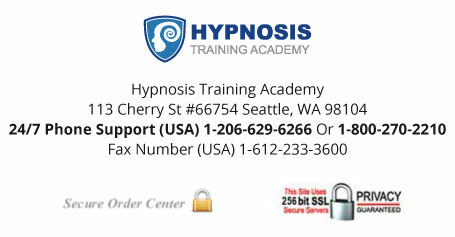 Instant Access to the complete package of exclusive training to turn me into a conversational hypnosis expert. I can't wait! 60 Conversational Hypnosis Exercises. I understand by doing these exercises I will quickly ingrain your covert hypnotic secrets and techniques right into my unconscious mind for immediate recall as I need them. Full Transcripts of each video will be included. This way I can refer to the written material whenever I want. Featuring The Ledochowski Rapid-Training System. I understand you apply a specific implicit learning process to teach conversational hypnosis. Your process will allow me to quickly and easily make this skill second nature. Plus... I get over 4 hours of EXTRA Advanced Bonus Training. And my investment today is $747 just 4 simple monthly installments of only $97 (50% OFF Discount) . And, I'm covered by your 60-Day Money Back Guarantee on top of all that! "I Do Like Igor's Teaching Style..."
"Learning With Igor... Just Happens Without You Even Realizing It..."
"Absorbing More Information Than I Thought That I Would..."
"... Shortens The Path To The Objective..."
"I Can Use This Any Time, Anywhere..."
"Now I Have The Confidence..."
"Igor Makes It Most Easy To Understand..."
"I'm Really Surprised How Easy It Was..."
"Exercises Allow You To Put Things To Use Immediately In Every Day Life"